Elizabeth Burns: Poetry Friday: Good Masters! Sweet Ladies! Poetry Friday (will be edited tonight to add round up information ) The Round Up is at Literary Safari. Good Masters! Sweet Ladies! 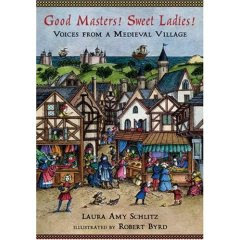 Voices from a Medieval Village by Laura Amy Schlitz. Illustrated by Robert Byrd. 2007. Library copy. One of my personal Best Books 2007. Inhabitants of a medieval village, from nephew of the Lord to beggar, provide a look at their lives via poetry and prose. There is a map of the village (a Medieval Manor, England, 1255) with plenty of details to linger over, from the various walls and fields, including the characters in the book. Each person speaks once; tho characters sometimes mention once another, giving a fuller picture of each individual and the village itself. While most speak in varying forms of poetry, there is some prose; and there are also historical notes to explain things. For example, the son of a knight mentions the Crusades as he would see it; the note provides more detailed information on the Crusades. How would I classify this book? Poetry? But it's got more than poetry, and will history lovers find it there? History? The people are made up; and while there is an amazing bibliography (four pages worth!! ), so I trust the history included, made up people saying things, even saying things based on historical fact, is, in my never to be humble opinion, fiction. Fiction? While I love how this conveys a world, and a world view, there isn't really a plot or a main character. Final words: great for teaching or classroom use, at home and at school, because in addition to the history aspect, the poetry is written to be read, like a play. So, a fun way to practice memorization and speaking skills. More final words. It's illustrated by Robert Byrd, and he captures a medieval style and also includes tons of details for readers to pore over. When my father's flesh is cold. The rest of the poem is in the book. Candlewick, the publisher, has these sample pages online, which also show Byrd's illustrations. Here are two more poems, with footnotes. THIS one is on my permanent shelf for MUST HAVE. When I read Betsy's review of it awhile back I got all enthused - thanks for the reminder! Great story as for me. I'd like to read something more about that topic. Thank you for giving that info.